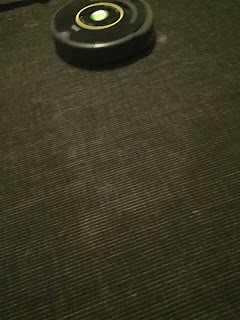 We heard from several people who loved their Roombas, so an order was placed and today the Roomba arrived! Daddy did the unpacking and setting up with a lot of help from the kids. She had to go into her dock for a rest and charge before we could set her loose on the mountains of dog hair - I mean, those thousands of heavenly fibers of love and joy. The kids helped with that too. We had to wait until the little "Clean" light turned green. It took a while but finally she was ready. Would she pass the test? We took her to the worst spot on the boat, the master stateroom floor. 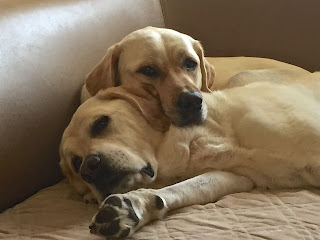 Mom has been laid up with a bad foot and the kids have been keeping her company. 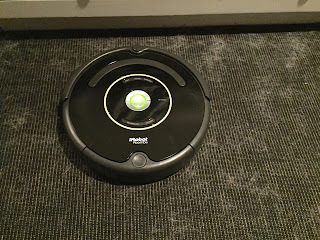 She's not able to easily vacuum and as is widely known, the male of the species has a deadly allergy to vacuum cleaners (and dishwashers and washing machines...). We let her loose, wisely keeping the kids below. She took off. So far so good. After about a half hour of listening to her rumbling across the floor and one trip by Jeff to empty the dirt bin, Mom decided to hobble up to the stateroom to check things out. She was amazed. 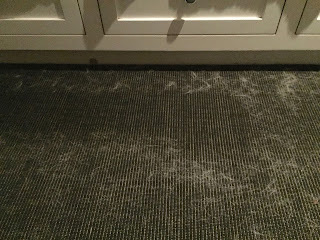 This is the same spot with the dog hair (I mean, thousands of heavenly fibers of love and joy) gone. At least, until the crew heads up for bed. Tomorrow we unleash her on the salon and galley. We'll have to figure out where to keep the kids. Who says we don't know how to party on the weekends? Until I saw the picture, I had no idea what you were up against. Of course, its summer in Virginia and all living things want to shed as much as possible in the heat. 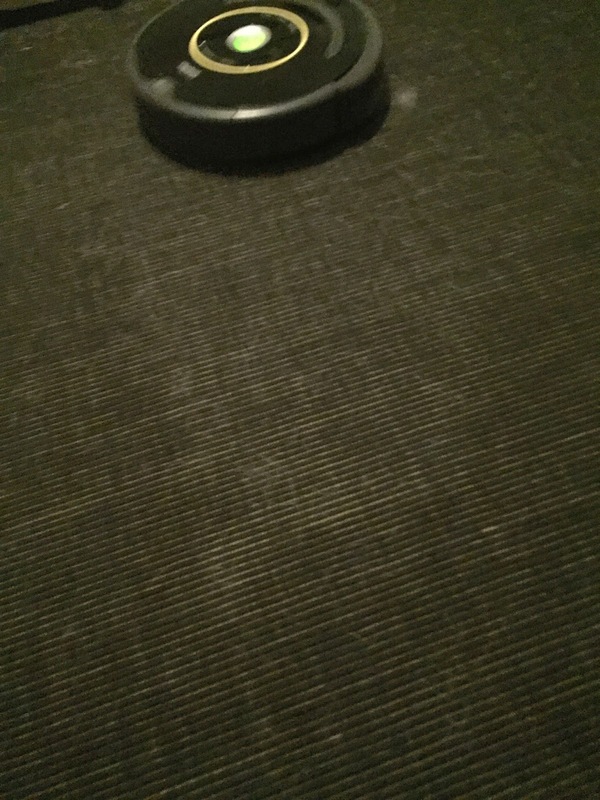 The Roomba looks like a winner so far. Anxious for you to post continuing updates. 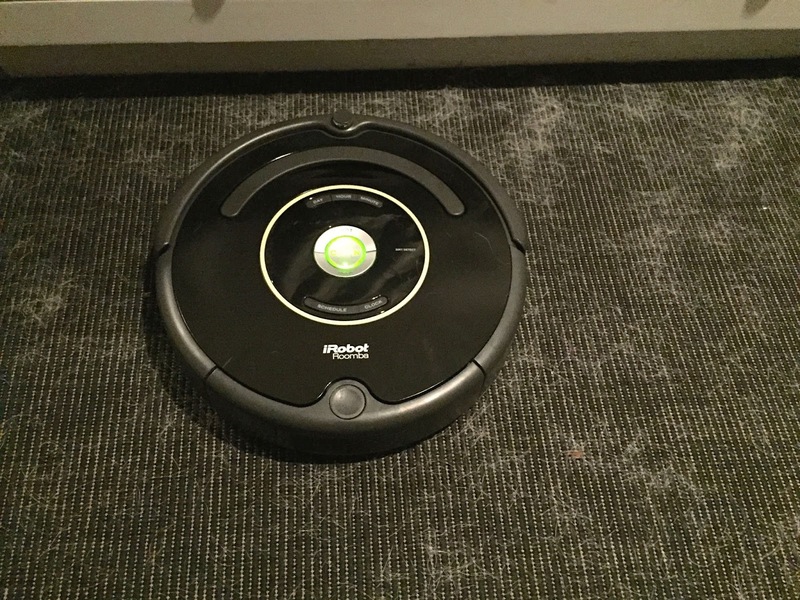 It's a requirement that you name your roomba. Mine is Rosie ( from the Jetsons of course). Wouldn't have thought that it would work as well as you've demonstrated. I'm impressed. Can you share which model it is? 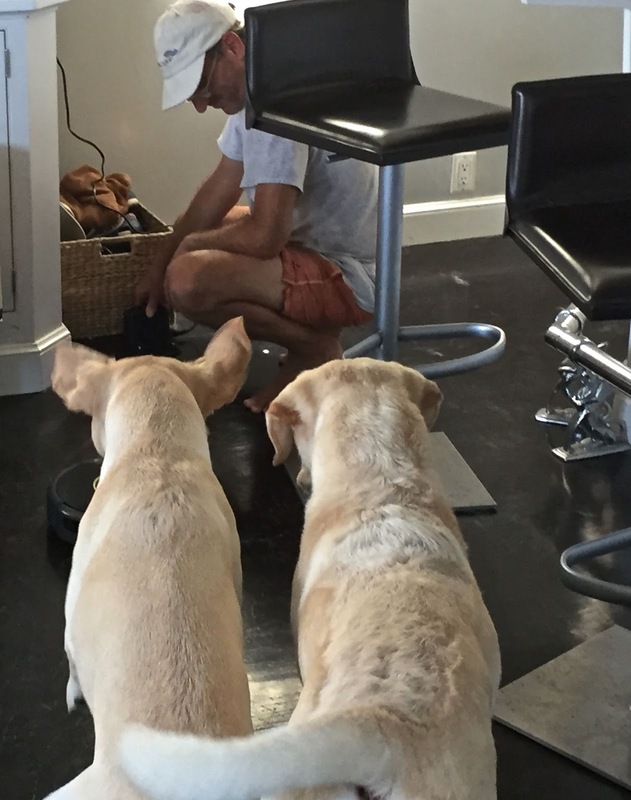 If it'll handle two blond Labs, surely it could handle Bart! 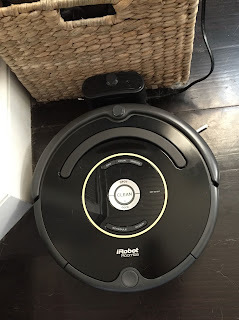 We have been using her - I'm told we need to give our Roomba a name... - about every other day and she works great! The only issue is the deep shag area rug in the salon. As soon as I put her on it she errors and tells me to move her to another place. Yes, she talks. But we want to get rid of that anyway. We purchased the 650. I was looking at the 900's which they advertise for pet hair. 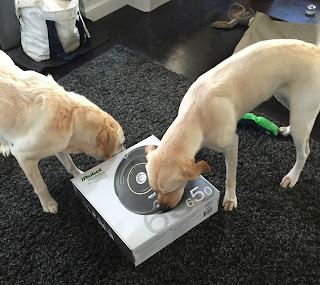 The reviews were great but there was a delay getting one. 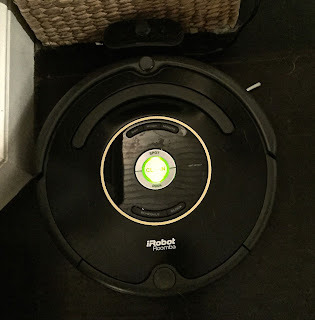 So I checked out the 650 and the reviews raved about it working with pet hair as well, so I decided to give it a try. Dylan and Dee Dee are glad I didn't go with the more expensive one. Hey, $500 can buy a lot of dog treats! Thanks so much for the feedback. 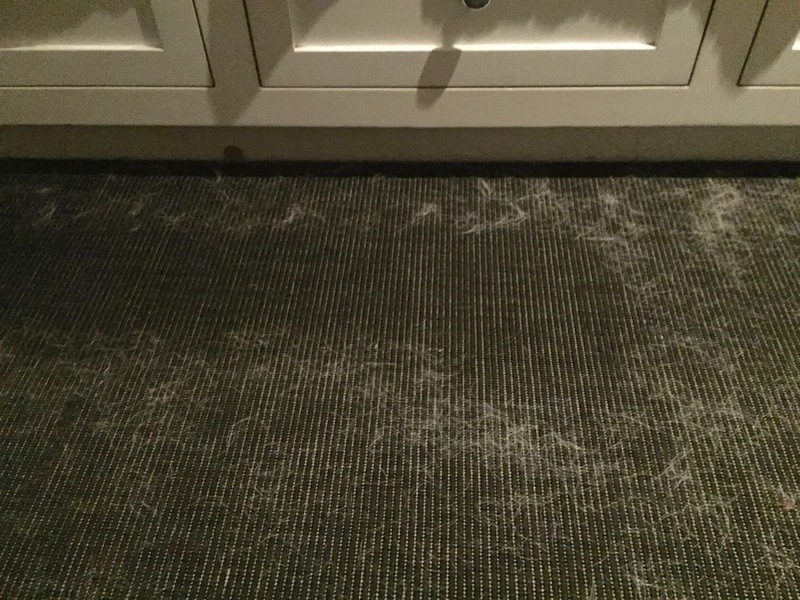 People love loving our dog until they see the traces of him he leaves behind. 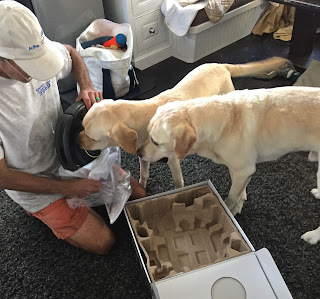 I'm wondering about the next generation of Roomba's that can scale vertical surfaces and vacuum the dog fur that sticks to the fibreglass on the boat! I've warned Bart, just as I'd warned our black Lab before him, that our next dog is a Poodle. Life never goes quite as planned though! Can't wait to see what DD&D do to your Roomba when it swallows a leftover cookie crumb. Oh yeah, with Labs there's no such thing as a leftover cookie crumb! Karen- when we had the boat, we had two Roomba's - I absolutely loved them!!! When they died, there was no trade-in/upgrade so I haven't had one now for a few years much to my dismay but with three pups, the Dyson is a charmer for the house. You'll love them.